Take a look at the U.S. economy since Trump was inaugurated. Politics have certainly become livelier in the U.S. since President Donald Trump was elected to office in November 2016. But cutting through all the noise — such as Russian election tampering, international trade disputes and a revolving door of White House staff — it’s worth focusing on one of the original, core messages in Trump’s campaign: making America great again. Part of that message was to grow wealth in the U.S. The performance of the stock market since 2016 seemed to support Trump’s election promise, as both the Dow Jones Industrial Average and S&P 500 soared to record new heights — or at least until the last quarter of 2018, when both took sharp nosedives. These developments, along with the two-year anniversary of Trump’s inauguration, make it a fitting time to analyze how Trump changed the financial landscape in America. 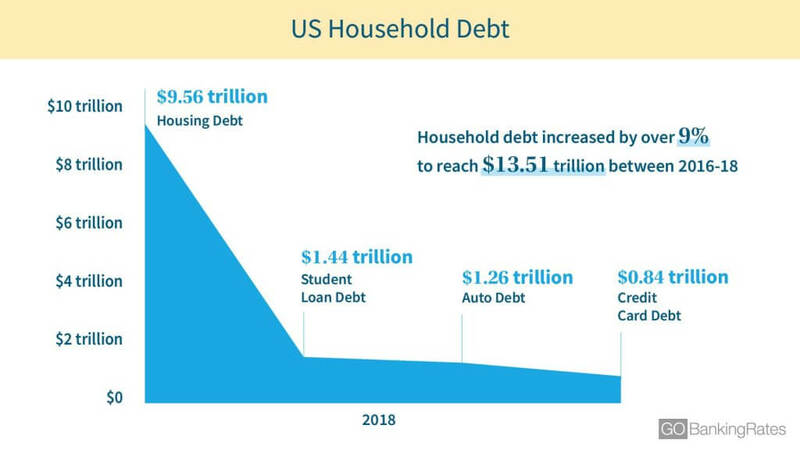 From the third quarter of 2016 to the third quarter of 2018, American household debt increased by over 9 percent to a total of $13.51 trillion. The form of debt that grew the fastest — by 12.5 percent — was student loan debt, standing at a staggering $1.44 trillion. This is a massive source of debt that Americans in the past largely didn’t have to deal with. Adjusted for inflation, the cost of tuition and fees for the 1988-89 academic year was $17,010 — which is approximately half of what it costs for students enrolled in the 2018-19 academic year. The second-fastest increase in debt levels was credit card debt, growing by 12 percent to a total of $840 billion. In third, auto loan debt increased by 10.5 percent to total $1.26 trillion. Debt isn’t just financial pain — it also prevents you from using your money elsewhere, whether it’s investing or retirement. In a recent GOBankingRates survey, 42 percent of Americans said they would save more for retirement if they could reduce their debt. Looking back on the most recent U.S. Census data, the median household income grew by 7 percent, from $53,889 in 2015 to $57,652 in 2017. However, these top-level figures hide more complex patterns underneath — namely, the uptick in income inequality. 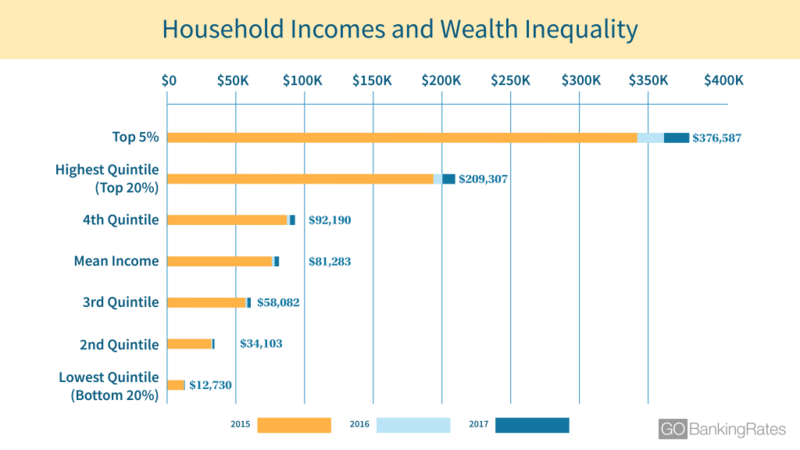 The lowest quintile, or bottom 20 percent of households, saw its mean income grow modestly by only 6.5 percent, from $11,952 in 2015 to $12,730 in 2017. In fact, the quintiles associated with middle-class incomes all saw growth between 6.9 percent and 7.2 percent. Meanwhile, the highest quintile, or the top 20 percent of households, saw its income grow by 8.2 percent, and the top 5 percent of households showed a 9.2 percent increase. Throughout the country, the growth in incomes has not been equal. Lower and middle-incomes might be rising, but wealthier Americans are getting rich more quickly. 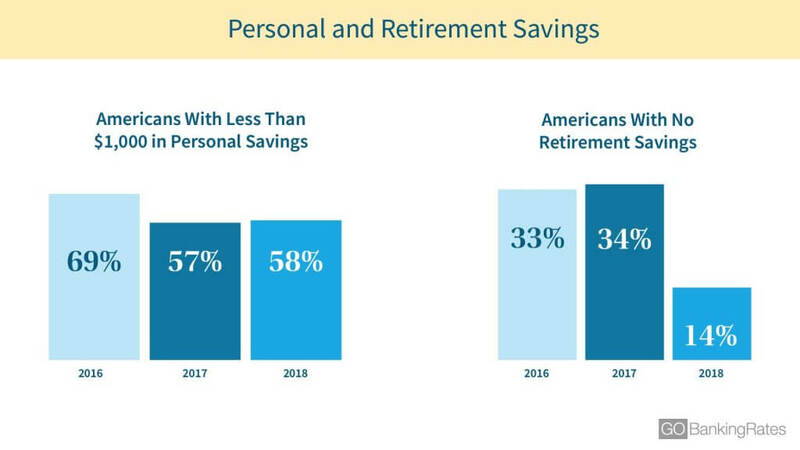 Although Americans are struggling to grow their personal savings, there has been steady improvement over the years. In 2016, 69 percent of Americans said in a GOBankingRates survey that they had less than $1,000 in savings. In 2017, that percentage dropped to only 57 percent of Americans. Though the figure increased slightly to 58 percent in 2018, that’s still down more than 10 percent since 2016. Similarly, retirement savings habits have improved. In 2016, 56 percent of Americans surveyed said they had less than $10,000 saved, which is below a rule-of-thumb retirement savings base for 25-year-olds. By 2017, that rate fell to 55 percent before dropping again in 2018 to only 42 percent of survey respondents — meaning fewer Americans will retire broke. Since 2016, home prices have steadily risen, with the national median home price growing by 12.7 percent from $245,000 in November 2016 to $276,000 in November 2018, according to Zillow. The housing markets that beat this trend are an interesting mix. 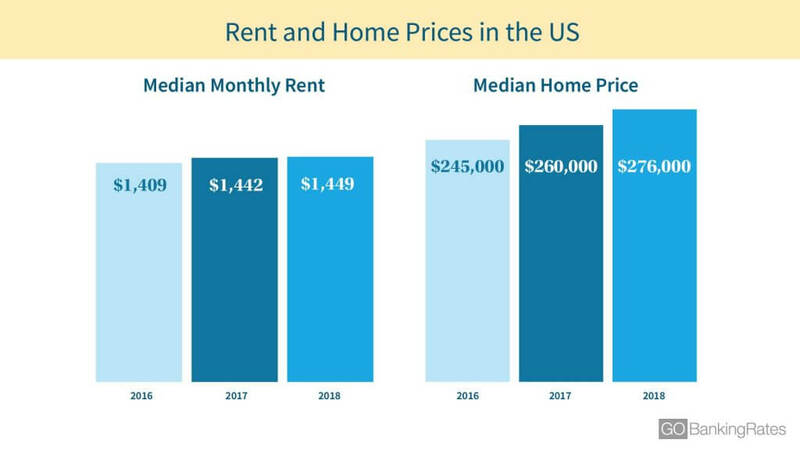 For example, the median price in the New York metro area rose 13.7 percent, whereas the median price in Los Angeles fell short, rising just 7.7 percent. Granted, Los Angeles began from a higher base, but so did San Jose, Calif. — and that market saw its median price increase by 17.8 percent, from $848,694 in 2016 to $999,888 in 2018. 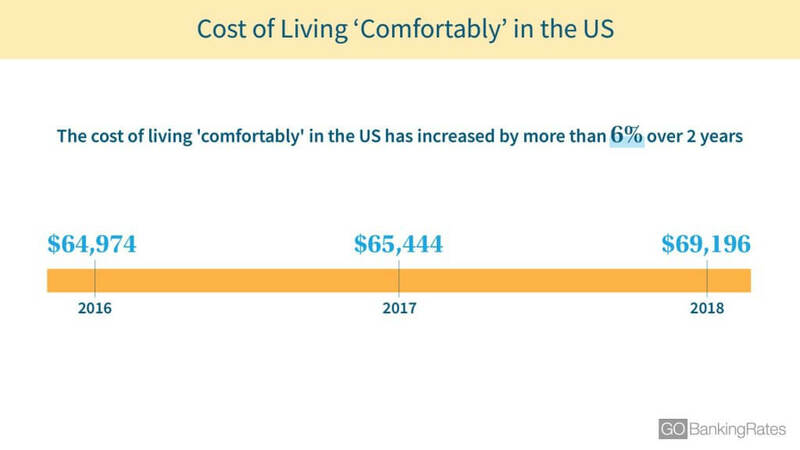 Every year, GOBankingRates gathers data from the Bureau of Labor Statistics, Zillow and other sources to conduct its “Live Comfortably” study, which determines the income you need in order to live comfortably in America’s 50 biggest cities. The income requirements fit the 50/30/20 budget rule, allocating 50 percent for necessities (such as rent, food and utilities), 30 percent for discretionary spending and 20 percent for savings. Data sourced from the Bureau of Labor Statistics’ Consumer Expenditure Survey. With student loan debt skyrocketing, education trends are more important than ever. Since 2016, college tuition costs have steadily increased year over year, but the rate of growth differs depending on the type of school. According to the College Board, the average tuition for state residents attending a public four-year university for the 2018-19 academic year is up 5.8 percent from 2016-17. In comparison, tuition for out-of-state students attending public four-year institutions is up 5.9 percent. 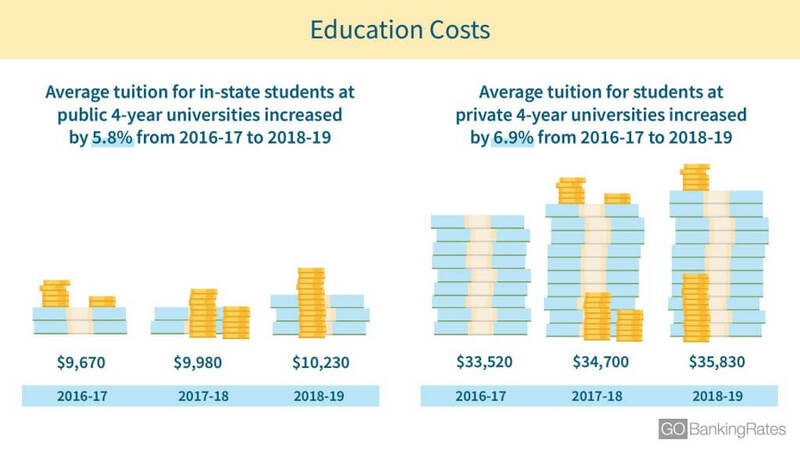 Private school tuition costs increased the most — by 6.9 percent, from $33,520 in 2016 to $35,830 in 2018. Data sourced from the College Board. There are important trends underneath the growth in tuition rates. One of the most striking is the increase in undergraduates enrolling in private four-year universities with tuition and fees of $51,000 or more. In the 2016-17 academic year, only 7 percent of undergraduate students attended schools that cost this much. In the 2018-19 academic year, however, 19.6 percent of undergraduates attended universities where tuition and fees cost $51,000 or more. Americans will certainly feel a direct impact from the Trump administration when they’re filing their taxes. The 2018 tax season, which begins on Jan. 28, 2019, will be the first to reflect changes enacted by the Tax Cuts and Jobs Act of 2017. 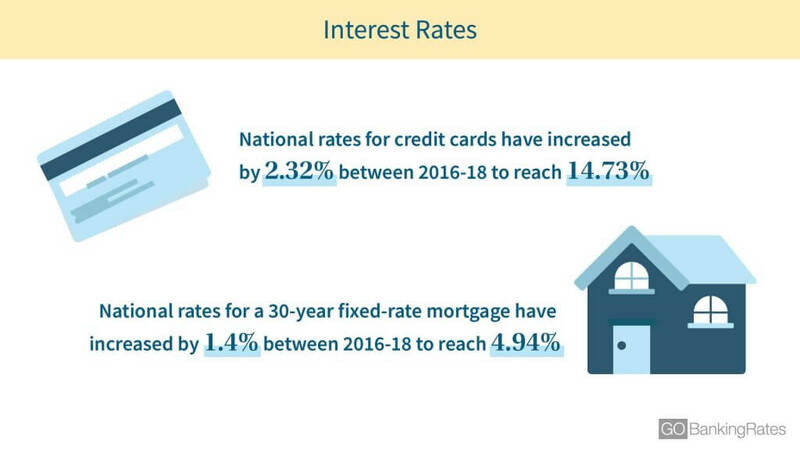 Interest rates have surfaced in the news throughout Trump’s presidency, especially in the last quarter of 2018. Back in October 2008, the federal funds rate dropped below 1 percent and stayed there for nearly a decade. In fact, the fed funds rate hovered at just above zero for years, from December 2008 (0.16 percent) to November 2015 (0.12 percent) — which was unprecedented in modern U.S. history. A decade after the Great Recession, the Fed began raising interest rates in 2016. During Trump’s first full year as president in 2017, the fed funds rate rose back to more than 1 percent in June, and then above 2 percent in October 2018. Data sourced from the Federal Deposit Insurance Corporation, retrieved from the Federal Reserve Bank of St. Louis. Even if Trump hasn’t had a serious effect on the economy, it’s crucial to know where Americans stand financially during any presidency. After all, their financial circumstances impact administrations. Though administrations can hardly be blamed for an economic downturn, the American people tend to see their leaders as somehow responsible. Click through to find the best and worst states for the middle class in Trump’s America. Methodology: GOBankingRates determined the state of the American wallet by analyzing data along the following factors: (1) household debt, including credit card debt, housing debt, auto debt and student loan debt, sourced from the New York Federal Reserve Bank; (2) rent and home prices, sourced from Zillow; (3) median household incomes and income inequality, sourced from the Census Bureau’s 2017 American Community Survey; (4) tax rates, sourced from Tax Foundation; (5) personal savings and retirement savings, sourced from GOBankingRates’ annual savings survey and retirement savings survey; (6) interest rates, including credit cards, savings accounts, checking accounts, certificates of deposit and 30-year fixed mortgages, sourced from the Federal Reserve Bank of St. Louis; (7) cost of tuition, sourced from College Board; (8) cost of goods and services, sourced from the Bureau of Labor Statistics’ Consumer Expenditure Survey; and (9) cost of living comfortably, sourced from GOBankingRates’ annual “Live Comfortably” cost-of-living study. How Much Money in Old Satellites Is Floating Up in Space? Space junk is also dangerous to the working items out in space.